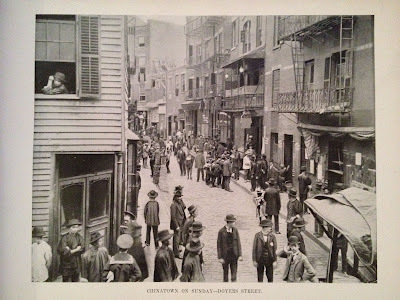 Looking down Doyers Street from Pell Street in New York City's Chinatown in 1899. Click HERE to see the street as it looks today on google street view. Photo from The New Metropolis, 1899. But for the clapboard building on the left, it looks like a stage set of Shanghai.